Sometimes if you want something done, you have to do it yourself. That’s the lesson Ginger Wheeler learned firsthand. The marketing consultant spent five years trying to interest various private and public agencies to take the lead in advocating for building a connector trail along the East Branch DuPage River Greenway Trail to no avail. 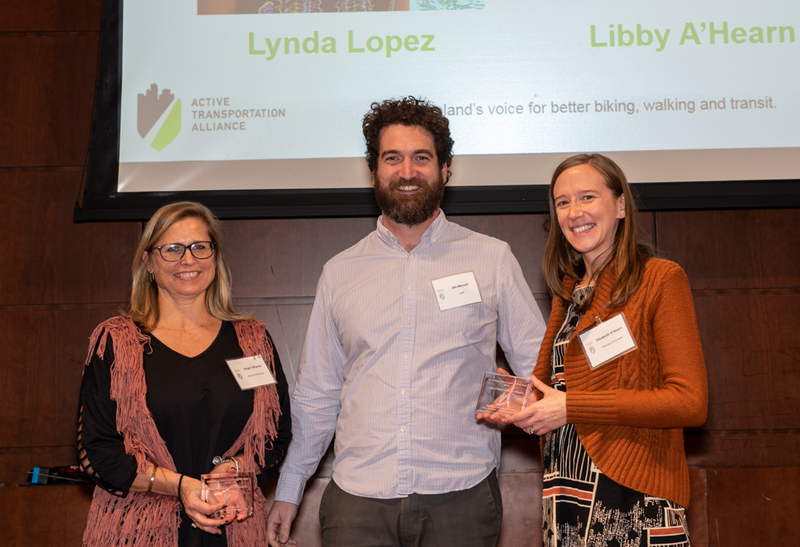 But when Wheeler (pictured left) met Libby A’Hearn (pictured right) at an Active Transportation Alliance event, they discovered that they had the same idea and decided to team up to get the funding needed to build the 31-mile East Branch DuPage River Greenway Trail. Together their partnership and leadership has moved the campaign forward significantly over the past year, earning them Active Trans’ Advocate of the Year award this past fall. Wheeler credits Active Trans for getting her to step up and lead the advocacy effort for the DuPage River Greenway Trail. The Glen Ellyn resident often cycles along the Prairie Path and the Great Western Trail, which are east-west routes located near her home. Accessing those trails via a north-south route is difficult at best. So Wheeler reached out to a variety of nonprofits, civic organizations and government agencies to see which entity would be willing to manage the development and construction of a north-south 5-mile connector trail between the Prairie Path and the Great Western Trail as part of the East Branch DuPage River Greenway Trail, a regional trail initially conceptualized in the 1990s but never funded. After five years, she was unsuccessful in getting an organization to commit to the project. 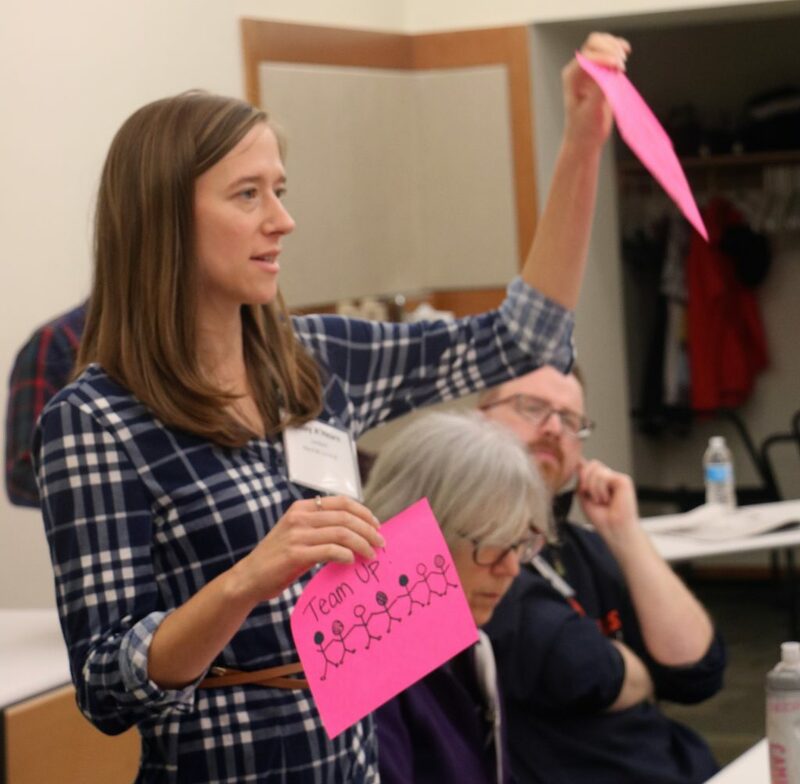 Then in 2017, Wheeler met A’Hearn in Elmhurst at a Bike Walk Every Town event, which is Active Trans’ suburban advocacy program that trains local residents to work for biking, walking improvements in their communities. The two hit it off when Wheeler learned that A’Hearn, a Lombard resident (pictured right), was also interested in building the East Branch DuPage River Greenway Trail because it would allow her to access the Morton Arboretum via bicycle from her home rather than driving to the arboretum with her bike. Although they don’t have any professional advocacy experience, Wheeler and A’Hearn have already achieved several milestones since they launched the campaign in 2017 to fund and build the East Branch DuPage River Greenway Trail, focusing on the north-south connector trail between the Great Western Trail and the Morton Arboretum. The duo collected more than 1,500 petition signatures in support of the project on change.org. With the petition in hand, they have met with several government staff members, stakeholders and elected officials. They have gained the support of every government official with whom they have met, including U.S. Rep. Sean Casten, Forest Preserve District of DuPage County President Dan Hebreard and DuPage County Board Chairman Dan Cronin. Wheeler and A’Hearn gained even more momentum for their campaign when they received a $250 grant from Active Trans’ Bike Walk Every Town program. They used the funds to build a website for the campaign and create a large map of the trail and a banner that they can use for their events and presentations. Active Trans also hosted a Bike Walk Every Town social in March 2018 in Glen Ellyn that proved to be crucial for the campaign. 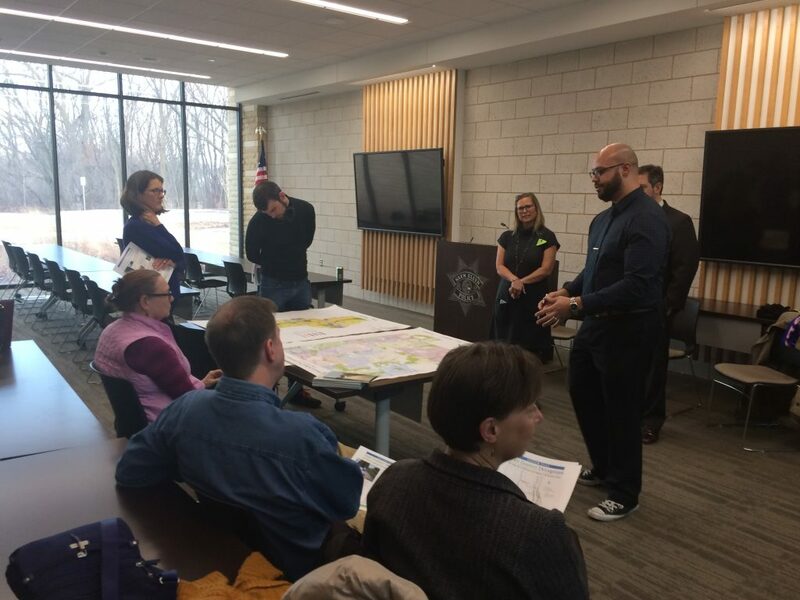 The event drew about 30 suburban advocates, who shared their best practices and insights, as well as Tim Elliott, a member of the DuPage County Board. The Bike Walk Every Town social also helped Wheeler and A’Hearn find others to help them move the campaign forward. With new members on board, Wheeler expects the campaign to reach more people and gain even more support. In 2019, they plan to make presentations at community organizations, like the Lions Clubs and Rotary Clubs; environmental organizations, such as the Sierra Club; and athletic groups, including running and bicycle clubs and runners’ clubs to bring further awareness of the importance of creating a continuous trail system for the East Branch DuPage River Greenway Trail. Wheeler, A’Hearn and other leaders of the group realize that garnering public support requires a concerted marketing effort. This led to creating a website, an active Facebook page and an e-newsletter. Organizers also pass out pins in the shape of a green flag that read “I ❤ EBDRT” (elected officials in the area have been seen wearing the pins). One of the ways they have successfully gotten others involved is by asking people to download the petition and collect signatures from friends and neighbors. With Wheeler and A’Hearn’s dedication, the East Branch DuPage River Greenway Trail campaign has already scored a huge victory. In the fall of 2018, the Forest Preserve District of DuPage County, DuPage County Board and Village of Glen Ellyn agreed to allocate $160,000 for a feasibility study to examine how to develop and construct the section of the trail in central DuPage County. With those budgets approved, the project also got a pledge of support from the Chicago Metropolitan Agency for Planning. Photo at top shows Wheeler (left) and A’Hearn (right) at Active Trans’ annual member meeting receiving an Advocate of the Year Award from Active Trans’ Managing Director of Advocacy Jim Merrell. Want to see better biking and walking in your suburban Chicago community? Bike Walk Every Town will help you develop the skills and access the resources needed to strengthen biking and walking in your community.